Because our top priority is customer satisfaction, our services are not limited to basic sweeping and cleaning. When we talk about property maintenance in San Bernardino, we think about the big picture and the little details. From expert parking lot sweeping, to much-needed repairs, we can handle any job of any size. We can repair and renovate your entire storefront to make it beautiful and safe. If your parking lot has struggled with potholes that developed long before you were there, we can fix it. We can turn a sad and neglected landscaping into a beautiful arrangement of low maintenance plants and flowers to add some color into your parking lot. Our parking lot lighting options can help you save on electricity, and ensure the security of your customers and employees. At Universal Site Services, our parking lot sweeping in San Bernardino services do not end with just simply brushing up dirt and debris. We use the most up to date equipment to reduce pollutants and provide the best possible results. Our vacuums are powerful enough to big up small specks of dust or even cigarette butts, papers, gravel, and large chunks of debris. The benefits of our technology are that you can trust excellent results that do not harm the environment. Plus, the benefits of parking lot sweeping can have a long-lasting impact on how you run your business. Regular parking lot sweeping in San Bernardino can reduce tripping hazards, deter vandalism, prevent potholes, and keep away unwanted rodent guests. The wear and tear on your pavement will be dramatically decreased with regular maintenance which will save you money on repairs and renovations. Pressure washers contain hoses with specialized nozzles that can help pick up dirt and debris and wash it all away. People have become more and more fascinated with pressure washing as people post before and after pictures that illustrate what the surface is actually supposed to look like. For instance, people are amazed to notice that the spaces between a tile surface are actually white instead of brown or black. Universal Site Services trucks can be equipped with the tools needed commercial pressure washing in San Bernardino. Pressure washers can clean off years of dirt, dust, and even mold or old paint. Wooden fences or decks will look even brighter, and it also helps decrease wear and tear on any surface. We only use EPA approved soaps so you will not need to worry about damaging soaps impacting your landscaping. Plus, we work around your schedule so your customers will never be impacted with backsplash from the pressure washers. Routine pressure washing combined with regular parking lot sweeping will not only dramatically improve the presentation of your property, but it will also save you time and money on repair and renovation costs. 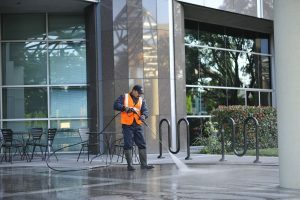 While Universal Site Services is known throughout California for how we beautify a building’s exterior, we can clean and maintain the entire property inside and out. Our experience is not limited to just individual storefront or business, but also arenas, shopping malls, government buildings, apartment complexes, schools, or large layouts of strip malls. We can work for any business, any size, and always within your schedule. Our customer service agents determine exactly what services you need and always understand that we work for you in order to give your building the best possible presentation. Commercial property maintenance in San Bernardino incorporates services for both outside and inside. For the outside, this includes parking lot sweeping and maintenance to even landscaping. Our teams know how to handle delicate flowers or large bushes and shrubs. Our inside services include restroom maintenance, trash receptacle maintenance, as well as general cleaning and minor repairs. We can even have day porters standing by at your building to tend to spills or hazards that could arise throughout the day. Our day porters are uniformed and friendly, and will never impede on your customers or your day to day operations. Does Your Property Require Special Care? No Problem! Universal Site Services is not limited to simply asphalt or concrete surfaces. For whatever reason, if you use an alternative surface for your storefront or parking lot, we got you covered. Sometimes people have dirt roads due to construction or have a low use back entrance that has not been paved. We can set up services to hand pick up trash and debris and we can help smooth the surface as the dirt wears from traffic. For crushed gravel or stone surfaces, we offer re-graveling to help make the surface less movable. The worst part about an unclean parking lot is that it makes the area more inviting to microorganisms that can cause allergic reactions and infections to people. 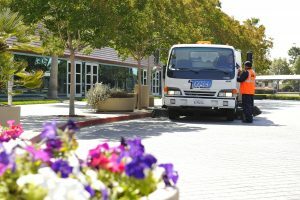 Reputable parking lot sweeping in San Bernardino will take all factors into consideration to prevent these things. Run-off from storm drains mix around oil, gas, and fluids from automobiles and then accumulate on your parking lot. This is not only unsightly, but these pollutants can be carried into drains and harm the environment. The cleaner the parking lot, the more likely that careless behavior like litter or dumping will occur. If the parking lot is looking beautiful, a person will know that it is regularly cleaned. Dirty parking lots actually encouraging littering because people carry the impression that their own garbage will not matter since someone else’s was already there. Well done parking lot sweeping provides the impression to people and passersby that the owner is responsible and cares about smaller details. When hiring any kind of professional to perform a job or service for you, you should make sure that they are the proper licenses and insurance to get the job done. 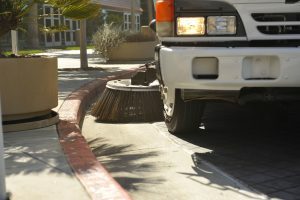 Parking lot sweeping may sound like a task that requires little skill, but the reality is that improper parking lot sweeping can lead to damage to your property. Only go with a company that stands by their promises and does not work “under the table” to give you the best price. Universal Site Services has the experience, licenses, and insurances to keep your property safe. We can transform a rundown business or storefront into an inviting environment for your customers. Give us a call today to begin discussing your parking lot sweeping and maintenance options in San Bernardino.